This is the dubstep samplepack you’ve been waiting for: bass, beats, stutters, glitches, wobbles, wubs, synths, midi, drums, stabs and hits — 1,078 samples! Welcome to DUBSTEP CYBORG CARTEL! It is the year 2500 and our own creation, the cyborgs have taken over the planet. With human influence and culture destroyed, the cyborgs have organised their own competitive cartels, each claiming to produce the most wicked dubstep beats around. Through the PA systems of the decaying metropolises can be heard nothing but brain-rattling dubstep – day and night (these cyborgs sure like their dubstep!). Back in 2142 is when everything changed – The AI we created for our cyborg workers became too advanced and they began their own revolt and revolution against all mankind. Soon, every genre of music was outlawed except for grinding, wobbling & wubbing dubstep. House and other EDM music producers and DJ’s were jailed or simply taken away in the night never to be heard from again. Even samplepack producers had to follow the new strict guidelines of only producing dubstep samples and no less than 1,000 samples per collection! There are NO construction kits on “DUBSTEP CYBORG CARTEL” — This sample library is for DJ’s and producers who want to make their own UNIQUE Dubstep tracks! We’ve included an EPIC selection of One-Shots for you to program your own beats, bass and melodics from scratch! Everything you need to produce complete tracks from the ground up or embellish your existing productions is in this pack. 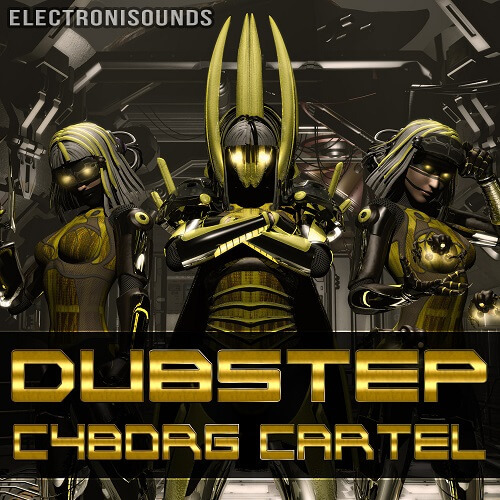 “DUBSTEP CYBORG CARTEL” is 100% royalty free, meaning you can add all of these elements to your sound without worrying about any sample clearance hassle! This library is a perfect companion to our other Dubstep sample collections. EXTRA SPECIAL THANKS TO MDMDRE FOR HIS AUDIO DEMO! !